Types of Collaborative Research Partnerships | Mentor Works Ltd. When Canadian businesses face innovation challenges, working with post-secondary institutions can be a great way to overcome them. There are many research support services provided through Canadian colleges and universities; the key is understanding what your project needs to succeed, and who can provide those services. Often, businesses can narrow down potential collaborators by having well-defined research projects. Establishing a plan before starting your partner search can streamline the process of finding and initiating the project and can also lead to an improved result. The first step is understanding whether your project requires academic or applied research. To do this, it’s helpful to think about how the findings will be commercialized, and the timeline for commercialization. Longer projects focused on generating new knowledge may be better suited for academic research, whereas short-term projects with a clear path to commercialization may be better suited for applied research. Academic research is often thought of as “exploratory” research and expands an understanding of the world. It is constantly evolving with the improvement of technology and enables researchers to develop or enhance theories. It typically seeks to understand the relationship between two or more variables and may ultimately provide a foundation for practical uses, although by nature, it is driven by curiosity – not commercialization. Research on a Field: Research that attempts to find common best practices within an industry and develops a theory about the optimal ways for those within a field to operate. Research for a Field: Research that expands the understanding of an industry and pushes innovation by creating new theories, as well as products, services, and processes never before thought of. Who Can Support Academic Research Projects? Academic research can be performed through universities and colleges alike; however, it is more common in a university setting. Universities are well-equipped to perform theoretical research projects because professors and students are driven to develop new theories. Many universities’ facilities are focused on advanced computing and can process big data to draw conclusions which would be difficult (or in some cases impossible) for researchers to identify on their own. Faculty and students can then assess and draw conclusions based on the statistical output of their research and provide a theory on why something is the way it appears. Applied research uses previously conceived theories to solve current challenges. Typically, the groundwork for these practical uses has been developed several years or even decades in the past but has not yet been applied to such a challenge. By nature, applied research is typically done for development purposes; there is a clear path to determining the viability of commercialization and implementing a solution. Formative Research: Identifies problems in a product, process, or service and seeks to better understand its root cause. Actionable plans can then be developed and implemented to address such a problem. Monitoring Research: Applies a solution to a problem and compares its effectiveness against other potential solutions also being tested. Solutions that do not offer much benefit to a problem can then be dismissed. Summative Research: Compares the effectiveness of all potential solutions to the research’s objectives. If the solution consistently produces a favourable outcome, it can then be adopted as a best practice. Who Can Support Applied Research Projects? Applied research can be performed through colleges and universities alike; however, it is more common in a college setting. Colleges are often well-equipped to perform applied research projects because they have highly-skilled personnel who understand how to apply technologies and can determine optimal solutions. Colleges and businesses both understand that projects should end with the commercialization of a new product, process, or service, and can help businesses expedite the process so a solution is brought to market quickly. Compared to colleges, universities are generally not as well-suited for applied research projects. While many universities have the capacity and capabilities needed to perform applied research projects, it is critical for industry partners to find suitable professors who possess the required specialization and resources. Project scope may surpass what a business has an actual need for, and may delay time-to-market, or may result in a solution that is more complex or costly than otherwise possible. Now that you’ve developed an understanding of industry academic collaboration projects, it should create an easier and more streamlined process to engaging either a college or university. Take some time to evaluate post-secondary institutions and develop a short-list of the ones that could give the most benefit to your company’s research project. Once you’ve selected some penitential research partners, it becomes even more important to understand your role in the research process. This includes writing proposals to gain the interest of professors and providing time and/or resources to support project deliverables. Industry partners may even help secure funding for research projects that offsets their overall cost. 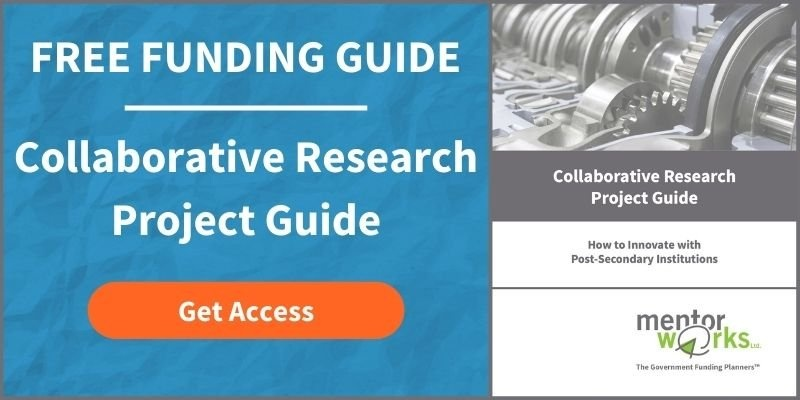 To learn the process of efficiently working with colleges or universities, please download Mentor Works’ Collaborative Research Project Guide.